This is a great looking L Shaped Zodiac Bar upholstered in Burgundy Zodiac with a Silver Zodiac “V”. Bob selected a natural wood finish for his shelving. 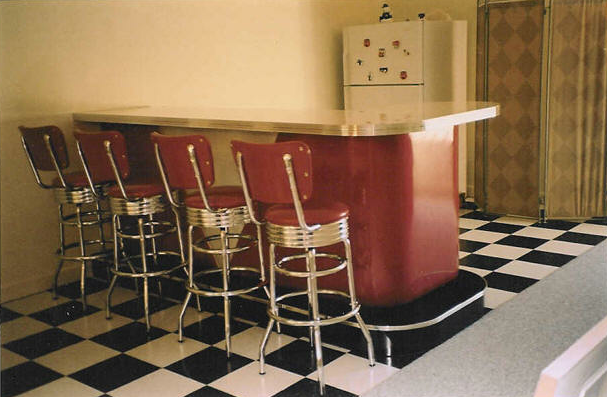 This bar is pictured with B1T3B stools upholstered in Burgundy Zodiac to match the bar. As this room has progressed, Bob has added a custom built credenza to match the bar as well as a TCB booth set. The contrasting paint colors and memorabilia are a nice added touch! I know that Bob has added more and improved his already beautiful bar…wish we had new pictures, Bob. Hint…Hint. If you would like a bar built to your specifications, send us an email or give us a call for a quotation.